February 28, 2012, Vancouver, Canada. El Nino Ventures Inc. ("ELN" and the "Company") (TSX.V: ELN; OTCQX:ELNOF Frankfurt: E7Q) is pleased to announce receipt of an initial NI 43-101 Mineral Resource Estimate for the Murray Brook polymetallic massive sulfide deposit in the Bathurst Mining camp, New Brunswick, Canada. The resource estimate was prepared by P&E Mining Consultants Inc. and G.A.Harron and Associates Inc. It is based on 60 vertical drill holes, totalling 10,327.5 metres that were drilled during the 2011 drilling program. A technical report will be posted on SEDAR within 45 days of this news release. (1) The quantity and grade of reported Inferred resources in this estimation are uncertain in nature and there has been insufficient exploration to define these Inferred resources as an Indicated or Measured mineral resource and it is uncertain if further exploration will result in upgrading them to an Indicated or Measured mineral resource category. (3) The Dec 31, 2011 two year trailing average US metal prices used in this estimate were $3.71/lb Cu, $1.03/lb Pb, $0.98/lb Zn, $1,397/oz Au, $27.63/oz Ag. The C$/US$ Exchange rate was 0.99. (4) Overall payable metal in the NSR calculation were 81% Cu, 72% Pb, 64% Zn, 71% Au and 56% Ag. (5) Mineral resources were determined within a Whittle pit shell with 45 degree slopes utilizing mining costs of C$2.50/tonne for mineralized material and waste rock, and C$1.75/tonne for overburden. (6) Costs used to determine the C$20/tonne NSR resource cut-off value were processing at C$15/tonne and G&A C$5/tonne. (7) The Murray Brook Mineral Resource Estimate was undertaken by Eugene Puritch, P.Eng. of P&E Mining Consultants Inc. Contained metal contents as calculated by El Nino Ventures Inc. are summarized below in Table 2. 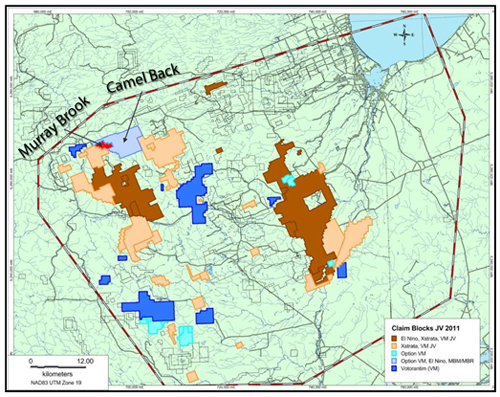 A $3 million budget has been proposed for the 2012-2013 exploration program that includes $2.5 million budgeted for drilling measured resources at the Murray Brook deposit and $500,000 exploration program on Murray Brook and Camel Back exploration claims defined by the option agreement with Murray Brook Minerals (Figure 1). The objective of the exploration plan is to search for large VMS deposits that might occur at depths of up to 150 metres below surface. The area to be explorated is located between the Murray Brook massive sulfide deposit, which is the 5th largest in the Bathurst Mining Camp (BMC), and the nearby Caribou deposit, which with total historic resources estimated to be 65 million tonnes, is the camp's second largest massive sulfide deposit. Eugene Puritch, P.Eng., G.A.Harron, P.Eng, and Dr. William Stone Ph.D., P.Geo are Qualified Persons ("QP") for purposes of NI 43-101. Eugene Puritch and G.A.Harron are the Independent Qualified Persons as defined by NI 43-101 responsible for preparing the Resource Estimate presented above. Eugene Puritch and G.A.Harron are principals of P&E Mining Consultants Inc. and G.A.Harron and Associates Inc. respectively, and they are independent from the Companies as described in section 1.5 of NI 43-101. Table 2 of this press release has been reviewed and approved for technical content by Dr. William Stone, Ph.D., P.Geo. Executive Vice President of Exploration of El Nino Ventures. Eugene Puritch, P.Eng., G.A.Harron, P.Eng., and William Stone, P.Geo. reviewed and approved the technical contents of this press release. Votorantim Metals Canada Inc. is a subsidiary of Votorantim Metais; a company that is part of the Votorantim Group that was founded in Brazil in 1918 operates in twenty countries and has over forty thousand employees. Votorantim Metais is the largest electrolytic-nickel producer in Latin America and one of the world's leaders in the production of zinc, aluminum and nickel. El Nino Ventures Inc. is an international exploration company, focused on exploring for lead, zinc, copper, gold and silver in New Brunswick, Canada and copper in the Democratic Republic of Congo ("DRC").